Craps is seen by many gamblers as a social game, which might make you think that it wouldn’t translate well to the world of online gambling. But craps has two features that make it just as attractive to online gamblers as it is in a live casino setting. First, it allows players to get lots of action, with dozens of bets available to players at any given time. Secondly, the game has some bets that are among the best in the casino for the player – including one bet that carries no house edge at all! The game might look confusing to a new player, due to all of the different bets you can make. However, the rules are fairly simple to learn, and from there, you can quickly add additional bets if you enjoy action (or stick to just the basics, if you want to limit the house edge as much as possible). Try out our free craps game now! The rules of craps are both simple and complex. The basic game structure is quite straightforward; on the other hand, the multitude of betting options means that there are countless ways in which you can win or lose money. We’ll first go over the most commonly made bets, then move on to the other bets available at the table. For discussions on the house edge associated with each bet, as well as which bets are the best (and worst) for the player, check our sections on strategies and odds further down the page. A new game starts with the shooter making what’s known as a come out roll. The shooter will always roll two six-sided dice. The dice are added together to make a total in the range of 2-12; for some bets, the exact numbers on each die are also important. The most fundamental bet in craps is the pass line bet. If the come out roll results in a 7 or 11, pass line bets win at even money. If the come out roll is a 2, 3 or 12, the come out roll loses. If any other number is rolled, that number becomes the point. The shooter now continues rolling the dice until he either throws the point for a second time, or throws a seven. If the shooter throws the point for a second time, the pass line bet wins at even money. If the shooter rolls a seven before rolling the point, all pass line bets lose. Making the pass line bet also entitles the player to take the odds behind the pass line when a point is rolled. Typically, you’ll be able to make an odds bet of 3-5 times your initial bet, depending on the specific rules of the casino you are playing in. We’ll talk more about the odds bets later, but it’s worth noting right off the bat that the payouts on the odds bets are statistically fair. For instance, there are six ways to roll a 7, and five ways to roll a 6 (or an 8); thus, the 6-5 payout reflects this, and means there is no advantage for either side on this bet. If you want, you can also bet against the shooter – and against most of the table – by choosing to bet on don’t pass. Players who do this are typically called “wrong” bettors due to the fact that they will be betting against the majority of the other players at the table. Of course, if you’re playing online craps, this usually isn’t a concern! Did you know that craps was actually derived from an old English game called hazard and is believed to be over 700 years old. The first version played in the USA was in New Orleans and contained a flaw that enabled players to have an advantage over the house. This was fixed when a man named John Winn introduced what we know today as the no pass bet. The come bet is just like the pass line bet, while the don’t come bet is nearly identical to the don’t pass bet. The key difference is that you can make these bets on rolls other than the come out roll. You can even take or lay odds behind these bets, as with the pass/don’t pass bets. Come out rolls do count when resolving come and don’t come bets, but – oddly enough – do not usually count for resolving the odds bets behind them, which the player can then choose to take back or keep active. Place bets are similar to the odds bets, only they may be made at any time on any number or group of numbers a player wishes. However, they also offer lower payouts than when taking the odds behind the pass line. In some online craps games, you can also make place bets to lose, which (like laying the odds behind a don’t pass bet) win if a seven is rolled before the number. A buy bet is exactly the same as the place bet, except that the payouts are the same as the fair amounts paid out when you take the odds behind a pass line bet. The only catch is that the player must pay a 5% commission when making the bet. In some casinos, this commission is only paid if the bet wins, which is a better arrangement for the player. Like buy bets, a lay bet offers fair odds that a seven will be rolled before a specific number, but require the player to pay a 5% commission when making the bet. This bet, like the buy bet, can be made at any time. The hard way bets allow you to bet that a pair of twos, threes, fours or fives will be rolled before a seven or any other way of rolling the same number. In other words, a bet on a “hard 10” will win if a 5-5 is rolled before a seven, or any other ten (such as 4-6). If you missed the come out roll, but still want to make a pass bet, you can make a put bet instead. You may then take the odds behind that bet as normal. The field bet is the first bet that we’ve discussed that either wins or loses on the very next roll of the dice. A field bet wins if the next roll is a 2, 3, 4, 9, 10, 11 or 12. All other numbers lose. In most cases, the field bet pays even money. However, on a roll of 2, the bet pays 2-1; on a roll of 12, it pays 3-1. Thanks to its widespread popularity, online craps is offered by virtually every casino on the Internet. You can play craps for real money at hundreds of different websites, with very little variation between the games offered at each. However, there are a couple points of comparison that can be made between online craps games when you’re choosing where to play. For the majority of players, the most relevant factor will be the multiple of odds players are allowed to take behind the pass line. The higher the multiple, the better, as this will allow players to wager more money without increasing the house edge. If you enjoy playing some of the more exotic bets on the table, you should check to see what odds are offered on the hard way, field and proposition bets. Different casino sites may offer different odds on each of these bets, and higher payouts can significantly reduce the house edge. Real live casino feel to the game. Easy to use in play features. Free throws for frequent players. Very user friendly. Electric atmosphere at Craps table. Offers players guide to playing craps. No US players. Excellent software & graphics. Easy deposit options. If you’re looking to have the best odds possible while playing, you’ll want to stick to the pass line or don’t pass bets. The house edge on the pass line is just 1.41%, while the house edge on the don’t pass bet is slightly lower, at about 1.36%. Of course, that bet also comes with having to bet against the other players at the table, so when you’re playing live craps, it may not be worth shaving 0.05% off of the casino’s advantage in order to irk your fellow players! In the online version of the game on the other hand, getting the best possible odds is probably the way to go. What makes these bets an even better proposition is the fact that they give you access to the odds bets. As we mentioned earlier, there’s absolutely no house edge when you take the odds or lay the odds. While this doesn’t take away from the edge the house has on your initial pass line (or don’t pass) bet, it does allow you to wager much more money without giving the casino any more of a leg up. It’s an offer you won’t find anywhere else in the casino, and not one you want to pass up! In a live casino setting, another aspect to strategy could potentially be dice setting. The legitimacy of dice setting is still a subject of debate, though many prominent gambling writers now believe that some skilled professional players can make a slight impact on the results of their dice rolls. 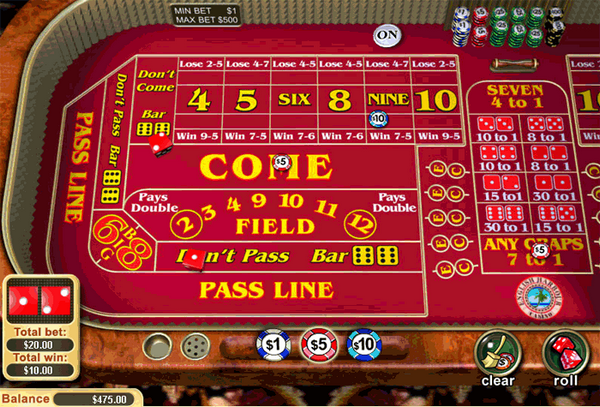 In online play, this is not a factor, since all rolls of the dice are simulated. Occasionally, the put bet may be a better option than a place or buy bet; this occurs when the multiple allowed for taking odds behind your put bet is very high (4-6 times the amount of the original bet). The total house edge on all the money you wagered in that case would be lower than simply making a place or buy bet for that same amount. The field bet is not a particularly bad option for those looking for additional action at the craps table. The house edge on the standard field bet is 2.78%. Hard way and prop bets carry very high house edges, similar to those seen in side bets in many other table games. Assuming normal payouts of 9-1 on bets on rolling six or eight the hard way, the house edge is 9.09%; a payout of 7-1 on rolling four or ten the hard way has an 11.11% house edge. In casinos that instead offer 9.5-1 and 7.5-1 on those bets, the house edge is halved. Other proposition bets also feature very high house edges, ranging from 5%-17% depending on the exact payouts being used in your casino. For instance, the “any seven” bet typically pays 4-1, which gives it a sizable 16.67% advantage for the house.